Navigating the digital advertising landscape in 2019 is incredibly challenging for any business. By now you’ve probably dipped your toe, or jumped right into these new and murky waters. But, have you ever taken the time to dig deep and understand the advertising metrics that are available to your business and how to measure the direct return on your advertising investment? Are you confident that the company you are placing your digital advertising dollars with is protecting your greatest asset, that is your well-crafted brand? 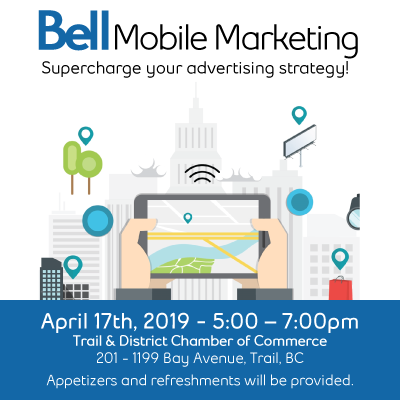 We want to invite you to our free information session that will show you how to super charge your advertising strategy with Canada’s most trusted digital media company, Bell Media. Our highly targeted mobile marketing strategy can reach your audience directly on their mobile devices, wherever they are. Modern, innovative, and powerful, Bell Mobile Marketing is an effective way to deliver your message. Want to learn more? Join us on April 17th from 5pm-7pm at the Trail & District Chamber of Commerce. Appetizers and refreshments will be provided and you don’t have to be a chamber member to attend. Please RSVP by clicking on the weblink above, text Shaun at 250-513-1117 or contact us at http://www.myezrock.com.